Ten cruise ships will be anchored in the port of Funchal for the new year, with several having already arrived in the Madeiran capital and others having forecast to contribute later. This morning, on Monday morning, the AIDAnova ‘giants’ (which arrived from Las Palmas by 4:30 am), Ventura – came from Tenerife and arrived at 8 o’clock, as well as Columbus, from Las Palmas . Likewise, they arrived in Madeira, both at eight in the morning, the Queen Victoria, in La Palma, and the Balmoral, coming from La Gomera. From Las Palmas came the Marella Dream, at 10 o’clock. In the afternoon and in the evening, Marco Polo is due to arrive at 6pm (from Las Palmas), Zenith at 8pm, Tenerife, AIDAstella at 9pm, from Las Palmas and Mein Schiff 1, which is scheduled to arrive at 9.30 pm from Las Palmas. 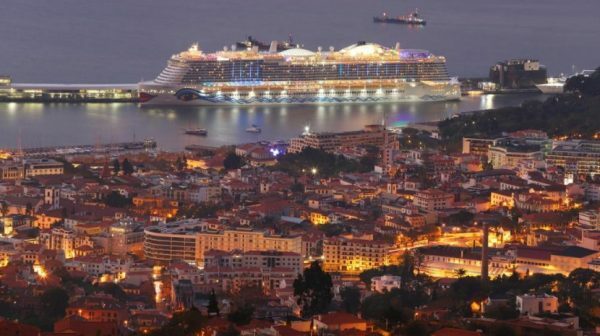 It should be noted that the number of ships is the same as last year, but that will bring more passengers than last year: an estimate of 25 thousand passengers, plus nine thousand crew, a total of 34 thousand people, according to the Administration of the Ports of the Autonomous Region of Madeira (APRAM). During the 12 events and the beginning of the traditional spectacle of fireworks, two ships will be in the port of Funchal, the Ventura, in the south quay, and the Dream Marella, in the north quay. The remaining eight will be anchored offshore.